Everyday cleaning is a great way to make sure that your house stays in good shape all year round and you don’t have to make a herculean effort when you do your seasonal cleaning. A little bit of cleaning everyday will make sure that when you do undertake large-scale cleaning projects, they don’t overwhelm you! Daily cleaning will really help keep the situation in check and the satisfaction of knowing that you are living a neat, orderly and hygienic life really makes it all worth the effort. Daily cleaning will also keep your home presentable at all times, which means if any surprises guests or visitors are to drop in, you will not have to scurry about the house trying to hide the mess and clean it up in a jiffy! Divide your daily cleaning goals into a room-by-room plan. This will help you tackle one room before you move onto the next, and will keep you focussed. You can also be careful not to spill the mess over from one room into another. You have to have a cleaning plan for each room, and a great thumb of rule to work by is to clean the dirtiest and most difficult places first. Why? Firstly, once you have tackled the tough spots, the rest of the room will seem much easier to get over with. Secondly, cleaning out the dirtiest spots such as from behind the sofa or under the bed will mean there are no hidden dirt and grime sources to mess up the rest of your cleaning. This principle of working from the inside out will make sure you don’t have to go over the same spots again and again. Start by cleaning up the clutter and things strewn around on the floor. You can’t really begin cleaning a room until everything is in place. Random objects lying around on the floor will only get in your way. Also remove any items on tables, stands and shelves that don’t belong there. After everything is back in its place, lightly go over all the surfaces in the room with a duster cloth or a feather duster. This includes all the small fixtures, items placed around the room, shelves and cabinets and anything that you think doesn’t need to be vacuumed. Next, use a vacuum cleaner to get rid of the dust. You can also sweep the floorboards with a broom at this point. Sweep and vacuum under the heavy furniture, clean the upholstery and shake down any heavy fabrics and linen. 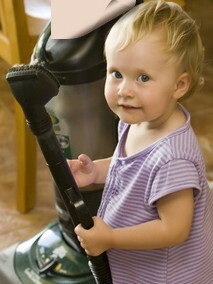 Carpets that are vacuumed daily are less likely to build up dirt and will remain in better condition over time. You need to clean only the surfaces because daily cleaning is for maintenance purposes only. Leave the heavy-duty activities such as beating the carpets clean or washing floorboards for your weekly and monthly cleaning projects. Mopping the floor is also recommended. If you don’t want to spend a lot of time cleaning daily, dry mopping is a good way to remove any dirt that you cannot vacuum. However, we also recommend using a damp mop to wipe the floor clean. Doing this everyday is a great way to get rid of most of the dirt on the floor and it adds a second layer of cleaning to the vacuuming and sweeping you did before. This step is essential if you have young children and pets in the house: you don’t want any debris or pointed, sharp objects or odd bits to hurt them! Daily cleaning also involves washing your clothes and dishes. It may seem like a needless burden at the end of a long day, but letting it pile up and having to tackle a huge amount of it at the end of the week will feel much worse! Nicole is passionate about travelling and healthy life. Read more about how to plan your Ealing house cleaning and create a happy home for you family.